You’ll never need, or want to move again! All residences at Carsins Run at Eva Mar have been designed by professional architects who are experts in providing for the comfort and convenience of mature residents. Every residence is beautiful and efficient, stylish and well-appointed, maintenance-free, and scaled for carefree, easy living. You can watch the video interview with the president of THW Design to find out what goes into the making of a CCRC. For seniors aged 60 and better, Carsins Run at Eva Mar sets the standard for Independent Living. We take care of all the details, so that you can enjoy a vibrant, worry-free lifestyle. 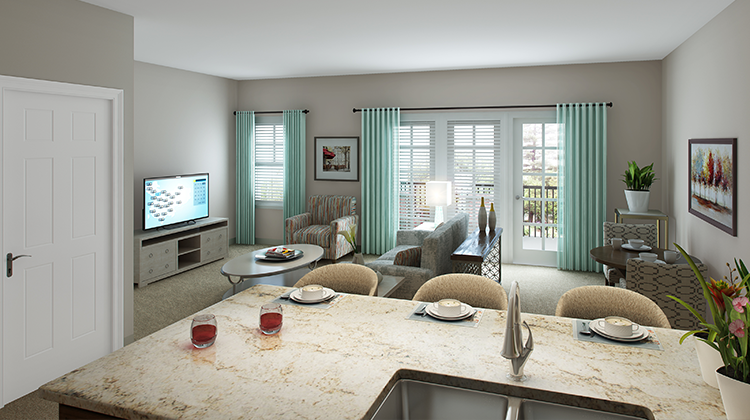 Carsins Run at Eva Mar is now accepting reservations for Independent Living residences. Many prime apartment locations are going fast! For complete, current availability and pricing information for residences, please contact us or visit the Carsins Run at Eva Mar Welcome Center located at 301 North Fountain Green Road in Bel Air, Maryland.